As my time in India draws to an end, I thought of sharing with you the photos of some of the birds I came across. Between my preaching and my surgery, my schedule was too packed for me to have time to go bird watching and so these are birds that literally brought themselves to me. I was still obedient to the Lord’s injunction that I should “look at the birds of the air” and be refreshed by them. This is the female Oriental magpie-robin. As with most birds, the female tends to have duller colours. 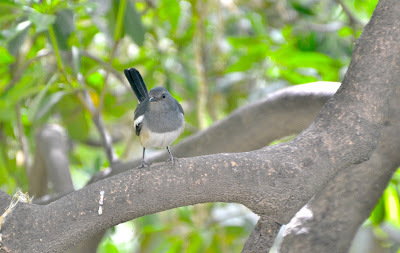 The male Oriental magpie-robin is black-and-white. It has a long narrow tail (like a wagtail) that it normally holds upright. The Oriental magpie-robin is a very common bird in India, whether in city gardens of rural forests, and has a beautiful song. It is the national bird of Bangladesh. 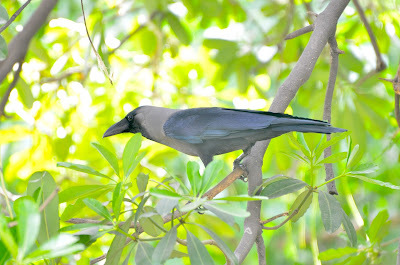 This is the House crow, a very common bird in India and has been exported around the world. It is a smaller version of the famous Mwankole of Zambia. Like most crows, it is very invasive and causes damage to crops and other wild life. They are normally found together in flocks and are found around human settlements in villages or cities because they tend to scavenge human leftovers. I first came across the Indian Myna in South Africa. Its reputation was not good. It is certainly not a bird you will describe as “friendly”. The United Nations has declared it one of the top three invasive birds on the planet. 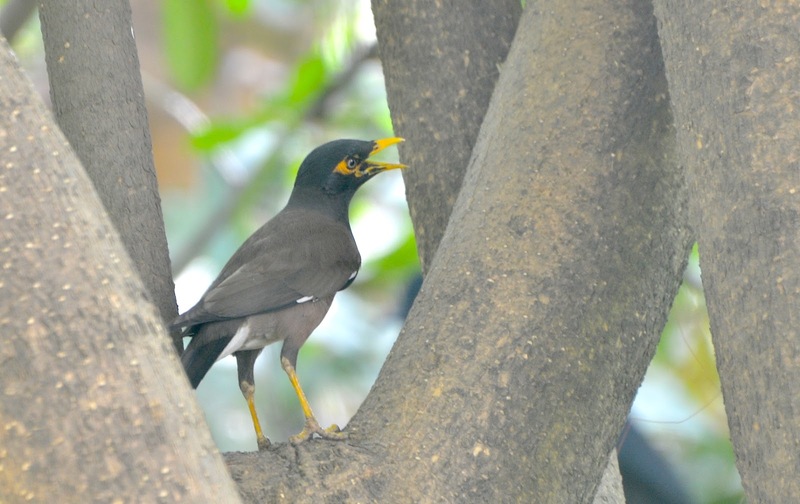 It is stated that the Indian Myna has been exterminated in Australia, where it was also exported from Asia and where it gained the name “The most important pest/problem”. This is a picture of the Jungle babbler—a bird that is hardly ever seen alone. Both males and females have the same dull colour. They are often in small groups and have gained the name of “Seven Sisters” or “Seven Brothers”. They are found in both cities and forests, and are very noisy. 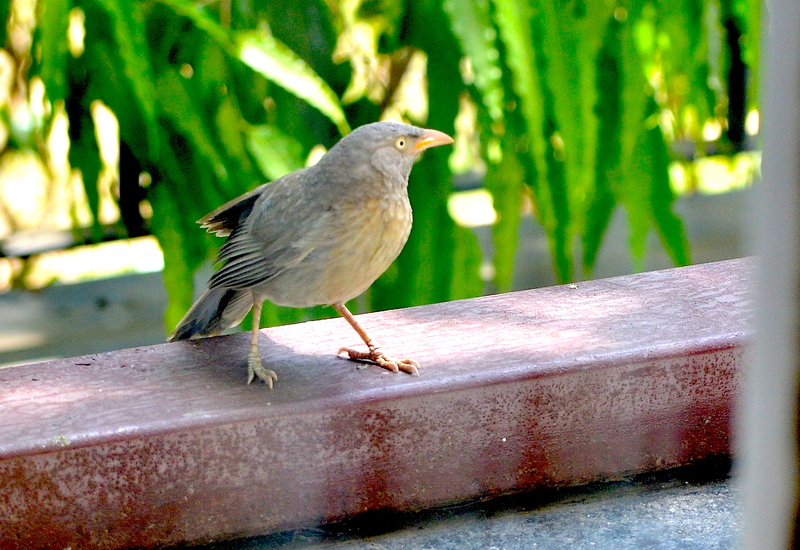 We have babblers in southern Africa (e.g. the Arrow-marked babbler). You cannot miss them when they are around! The most colourful bird that I managed to capture on my camera is the one I have left for last—the White-naped woodpecker. This one is male, identified by its bright red “hat”, while females have their “hats” in yellow. 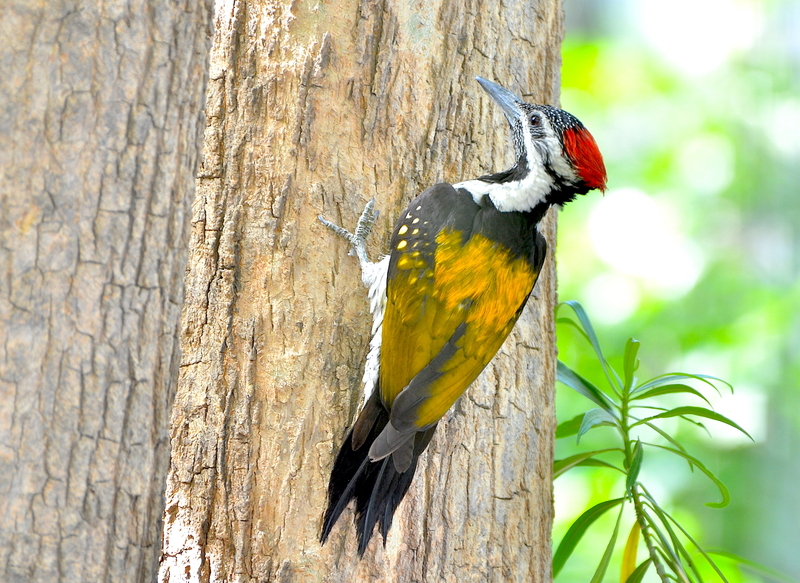 Their ability to balance themselves on vertical trees with their toes and tails and then use their strong beaks and long tongues to dig and dart into trees for insects is what sets woodpeckers apart from other birds. 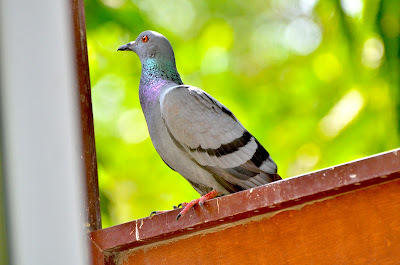 I had already posted this blog post when this Rock dove came to peep through the window at the home of our hosts (the Nsendulukas) as though to make sure I was still alive inside the home. Rock doves (sometimes called Rock pigeons) are common all over the world and are identified by their grey colour and two dark stripes on their wings. They are found in huge numbers among humans, especially in parks where they are being given free food (seeds). 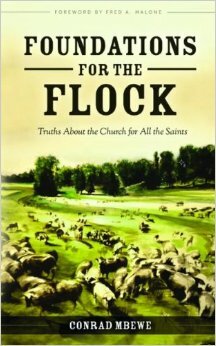 The tragedy on today’s ecclesiastical landscape is the number of heretics who are thriving inside evangelicalism. They are having a field day and hardly anyone is raising a voice against them. Behind closed doors we all seem to agree that these “brethren” are spreading serious error. But as soon as the door opens and one of them walks in, suddenly, we seem to be unsure and would rather be silent for the sake of Christian love. This begs the question, “How should we as Christians respond to the many wrong teachings that surround us, especially those serious heresies being propagated by people who are in the church?” This is an important question because we are living in days when the very nature of evangelical Christianity is being turned upside down. This is especially true because of those who are teaching what we call “the prosperity gospel” in its various shades. Many lives are being destroyed. The way of salvation is being confused. How should we respond to all this? We should respond to this by deliberately engaging in Christian polemics. What does the word “polemics” mean? Polemics means a strong verbal or written rebuttal of someone else’s belief. It is an argument that disputes another person’s opinion and shows that it is not true. It is the opposite of apologetics, which is a strong verbal or written defence of one’s own belief in the light of the attacks of other people. In other words, polemics and apologetics are two sides of the same coin. An apologist begins with the truth under attack and seeks to defend it, while a polemist begins with an error being propagated and seeks to refute it. 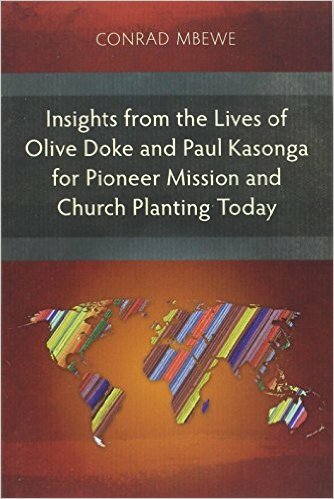 The Bible teaches that one of the responsibilities of a church elder is that of polemics. The apostle Paul said to Titus, “[An elder] must hold firm to the trustworthy word as taught, so that he may be able to give instruction in sound doctrine and also to rebuke those who contradict it” (Titus 1:9). Notice that it is not only the positive but also the negative. An elder must positively give instruction in sound doctrine but he must also negatively rebuke those who contradict sound doctrine. Why is this important? The apostle Paul said that this must be done because “there are many who are insubordinate, empty talkers and deceivers, especially those of the circumcision party. They must be silenced, since they are upsetting whole families by teaching for shameful gain what they ought not to teach” (Titus 1:10-11). If we keep quiet, heretical teachers will continue to upset the faith of many because of their personal quest for shameful gain. So, it is the responsibility of those who are in charge of Christ’s sheep to silence them. That is what polemics is all about. 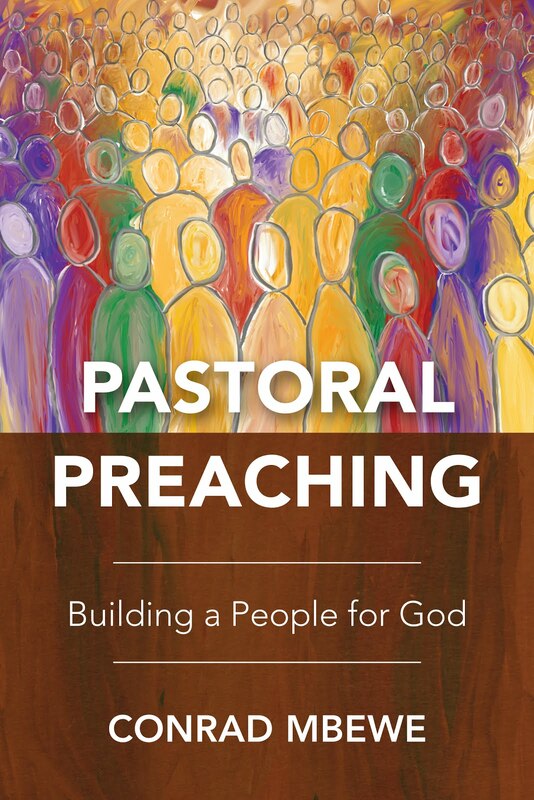 At one time, it was taken for granted that Christian pastors and teachers would engage in polemics as part of their duty. Being politically correct was not a virtue in those days. Error needed to be vanquished. The great American theologian B.B. Warfield held the chair of Didactic and Polemic Theology at Princeton Theological Seminary from 1887 until his death in 1921. There was nothing extraordinary about that in those days. Jesus stated plainly what the wrong teaching was. What were the Pharisees and the scribes teaching? Jesus said, “Woe to you, blind guides, who say, ‘If anyone swears by the temple, it is nothing, but if anyone swears by the gold of the temple, he is bound by his oath’… And you say, ‘If anyone swears by the altar, it is nothing, but if anyone swears by the gift that is on the altar, he is bound by his oath’” (Matthew 23:16, 18). What Jesus was opposed to was this clever way of telling lies or making false promises and getting away with it. Men were seeking to remain religious while they were inwardly ungodly. Jesus was not willing to let this go unchallenged. He pointed out that it was erroneous teaching. We too should not be afraid to point out the wrong teaching that is upsetting the faith of God’s people. I will take a little longer on this because we are living in a day of political correctness that is turning even God’s servants into wimps. Jesus used very strong language when referring to these false teachers. He said to them, “Woe to you, blind guides…. You blind fools! …You blind men! (verses 16, 17, and 19). In the same chapter, he also called them “Hypocrites, children of hell, serpents, a brood of vipers…” (verse 13, 15, 33) and he likened them to “white-washed tombs” (verse 27). Let us admit that Jesus was using very strong language here. Such language is not politically correct. Gentlemen do not normally speak like this. How should we explain this? First of all, this was not how Jesus spoke everyday. He was normally one who spoke with gentleness. However, it is evident that Jesus had been teaching true spirituality for about three years and these men were bent on resisting this and instead teaching error. This was Jesus now removing his gloves and telling it like it is. That is important. Sadly, there are some Christian teachers who seem to possess a perpetual split spleen and their entire ministry is full of nothing but vitriol, sarcastic contempt, and hurtful scorn. Hiding behind Jesus’ example here is to swallow an entire camel and strain a gnat. Having said that, Pharisees and scribes were not Jesus’ sparring partners with whom he needed to be gentle so that they could keep coming back to give him a good sweat. They were enemies who were destroying souls. They were rejecting the truth and teaching error, leaving destruction in their wake. They were closing the door of heaven on other people and making them twice the children of hell as themselves (verse 15). It was crucial that Jesus shows something of his feelings about these teachers of heresy. Paul did the same thing when he said that those who were teaching another gospel should “go to hell” (Galatians 1:8, 9). In fact, elsewhere he calls them "dogs" (Philippians 3:2). Jude was more scathing when he called such heretics hiding in the church as “…hidden reefs at your love feasts, as they feast with you without fear, shepherds feeding themselves; waterless clouds, swept along by winds; fruitless trees in late autumn, twice dead, uprooted; wild waves of the sea, casting up the foam of their own shame; wandering stars, for whom the gloom of utter darkness has been reserved forever” (Jude 1:12–13). All I am saying out of all these citations is that let’s not be shocked when strong language is used in polemics against heretics. Jesus and other inspired writers led the way in the use of strong language. The Lord Jesus Christ used logic and reasoning when showing the error of the scribes and Pharisees. He asked, “You blind fools! For which is greater, the gold or the temple that has made the gold sacred?” and “You blind men! For which is greater, the gift or the altar that makes the gift sacred?” (verses 17 and 19). Jesus was essentially asking, "How on earth can you make the gold more important than the temple when it is the temple that makes it important? In the same way, how can you make a mere gift more important than the altar when its very value depends on the altar on which it lies?" His message was clear: The logic is faulty. You simply need to think to see through it. Herein lies the power of polemics. It is not in simply stating the wrong teaching or using scathing remarks. It is in showing the absurdity of the doctrinal position taken by those who teach error. You see, human beings have brains that still function, especially when the grace of God has washed them from sin. Appeal to those brains. Heresy is irrational. Through logic we should show the absurdity of wrong teaching and win back those who are willing to think. The Lord Jesus Christ finally gave the right teaching to those who were listening to him. He said, “So whoever swears by the altar swears by it and by everything on it. And whoever swears by the temple swears by it and by him who dwells in it. And whoever swears by heaven swears by the throne of God and by him who sits upon it” (verses 20–22). Jesus was stating the truth here. It was not enough to state what the wrong teaching was, or to use strong language to give a verbal slap to those who are dosing, or to argue logically and thus show the error of the false teachers. He needed to finally state what should be believed. In the same way, one reason why error is thriving today is because we are too apologetic about the truth. We are living in a Post-modern age when there is no longer “true truth”. Thus, all we seem to be willing to do is question the correctness of others but not state unequivocally what the truth is. Our church members are thus left in doubt about the teaching of others but they do not know what to believe. We are telling them that they should not believe what others are teaching but then what should they believe instead? What is the truth? O that we may follow the example of Jesus. I plead for the revival of polemical teaching and preaching today. We are living in a very dark day. It is very sad what is being propagated in many a Christian pulpit in the name of evangelicalism. I say this with love: Many of the followers of the prosperity gospel are not Christians at all. This movement has become a sordid moneymaking enterprise. It is full of scandals. Its advocates must be publicly rebuked. Souls need to be salvaged from them through following the example of the Lord Jesus Christ. I close by saying, thieves love dogs but they love dogs that do not bark. If you have a dog that wags its tail when thieves come into your home to steal you had better sell it off quickly. God once described the prophets of Israel as silent dogs that cannot bark (Isaiah 56:10). Could he be saying the same things about us? Thieves have entered into the church. They are stealing from people’s pockets and destroying many lives. Are we barking at them or are we wagging our tails as they wreak havoc in the church? O that we may revive polemics again!